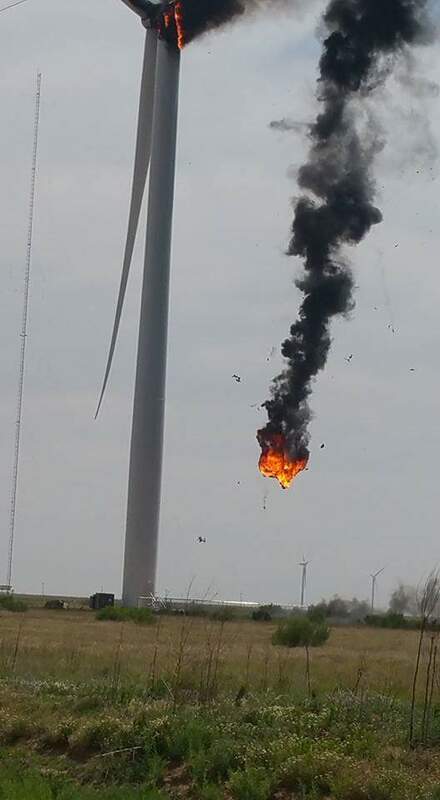 Texan Pyrotechnic Turbine Terror: Wind Power Setting the World on Fire | Wind energy, not cheap, not free, not green, not a farm or a park, not reliable, not dispatchable, not an answer, ..call it what it is..A SCAM! June 3, 2016 Website Mgr. Utterly pointless, on every level; and insanely dangerous to man and beast, one of the more exciting features of these things is their ability to spontaneously combust. Above is a video, and below is the story and pics, of a recent piece of ‘green’ energy pyrotechnics on the Prairie. 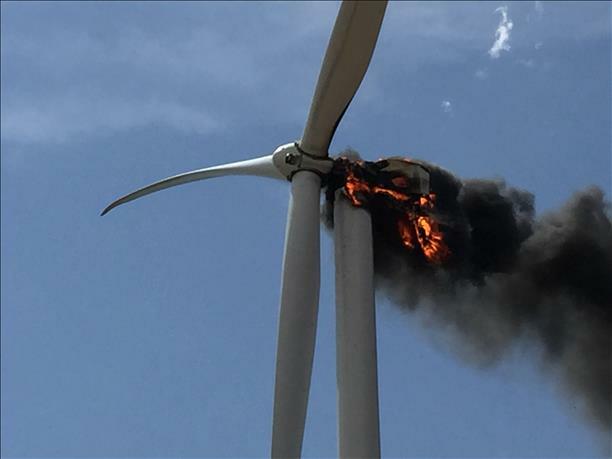 Lubbock County volunteer fire crews responded to a call of a burning wind turbine Monday afternoon. Firefighters on scene said there wasn’t much they could do except let it burn out. The fire was reported at 3:45 p.m., said Tim Smith, fire chief for West Carlisle Fire Department. Three departments responded to the blaze north of Reese Center and County Road 6400 including West Carlisle, Shallowater and Wolfforth. The turbine is part of the growing Prairie Dog WTG Project, Smith said. Representatives from the company that owns the turbine were on scene before firefighters arrived and told firefighters about 80 gallons of gear oil were inside it, Smith said. The fire was 300 feet in the air. Just after 4 p.m., debris could be seen falling from the structure and fire trucks could be seen driving around the base of the structure. 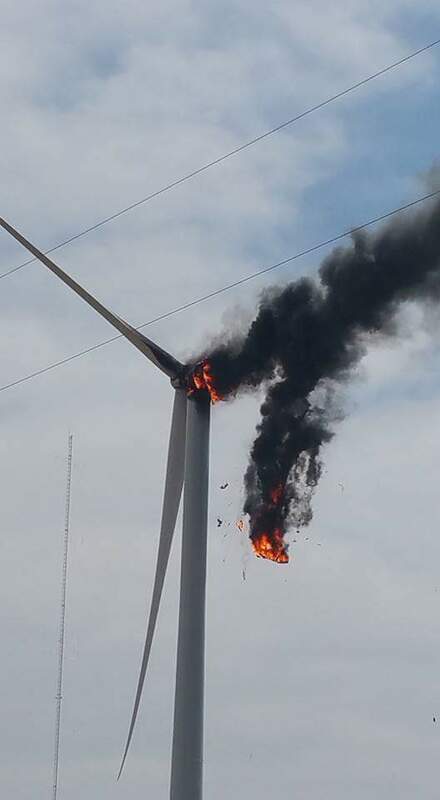 Smith said smoldering debris had already sparked a few ground fires since the initial blaze on the turbine started, but crews were able to extinguish them quickly. “This is a pretty rare event,” Smith said. 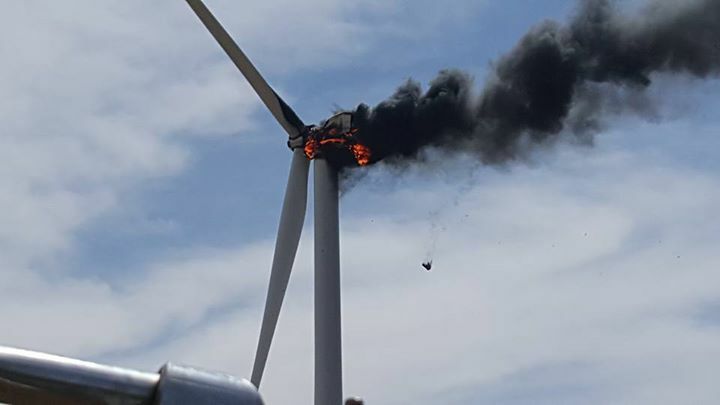 This is the first wind turbine fire he has seen in his 27-year career. The generator inside the turbine is believed to have sparked the fire but an investigation will be conducted later in the week to assess the damage, Smith said. Crews planned to remain on scene until the fire burned out.